Background: Gut microbiota is increasingly recognized as a powerful regulator of host physiology. Most of its effects are mediated through metabolites acting as energy sources, signaling receptor ligands and substrates for host enzymes. Owing to the meta-stability and high amenability of the gut microbiota to modification by diet and environment predicting specific gut microbes or its metabolites responsible for different host metabolic states is often confounded. Methods: The Pubmed was searched for research articles on gut microbiota and cardiovascular disease. Results: The searched articles reported a direct role of gut microbes in cardiovascular disorders (CVD). 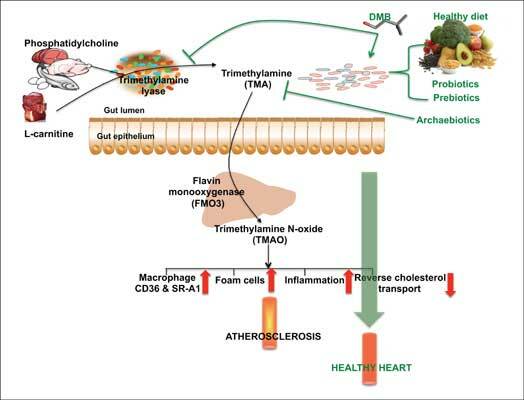 The interaction among gut microbial metabolism (through breakdown of certain dietary nutrients like choline), host immune system and lipid metabolism generate conditions that promote atherosclerosis development. Importantly, components of this interactive system can be explored to identify points of intervention in the path of disease development. Based on this strategies targeting gut microbial composition and activity are being explored as therapies against CVD. Use of archaebiotics and 3,3-dimethyl- 1-butanol aiming to reduce TMA (trimethylamine) conversion to TMAO (trimethylamine-N-oxide) and high fibre diets to reduce TMA precursors while simultaneously selecting for beneficial gut bacteria are attractive anti-atherogenic approaches. Conclusion: Success of these approaches in humans however, requires extensive research. Keywords: Cardiovascular disease, carnitine, choline, gut microbiota, trimethylamine, trimethylamine-N-oxide. Title:Gut Microbiota in Vascular Disease: Therapeutic Target? Keywords:Cardiovascular disease, carnitine, choline, gut microbiota, trimethylamine, trimethylamine-N-oxide. Abstract:Background: Gut microbiota is increasingly recognized as a powerful regulator of host physiology. Most of its effects are mediated through metabolites acting as energy sources, signaling receptor ligands and substrates for host enzymes. Owing to the meta-stability and high amenability of the gut microbiota to modification by diet and environment predicting specific gut microbes or its metabolites responsible for different host metabolic states is often confounded. Vascular Calcifications in Chronic Kidney Disease: Are There New Treatments? Anti-Platelet Therapy and Aspirin Resistance – Clinically and Chemically Relevant?